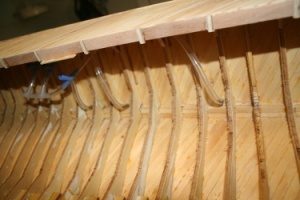 Once the hull is free of the building board and on the cradle. 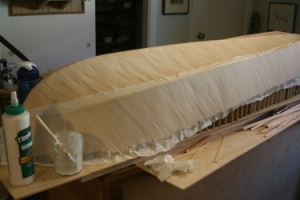 the next steps included trimming the upper parts of the ribs and preparing to plank the deck. 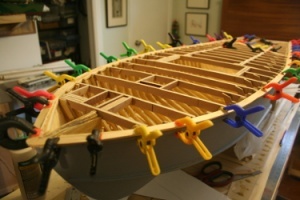 The first step was installing deck beams on alternate frames, using the deck beams to also frame up the various hatches to be added or created later. I used the same plywood for the deck beams as for the ribs, supplemented by hard maple for some of the areas needing reinforcement, such as the position of the Samson Post. Then I added the perimeter board/rub strake to the deck, using hard maple, the same thickness as the deck planking to be added later. 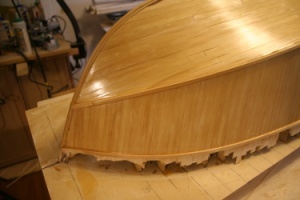 The deck was also planked in two layers, as the hull, with the first layer laid on diagonally and the second layer longitudinally. 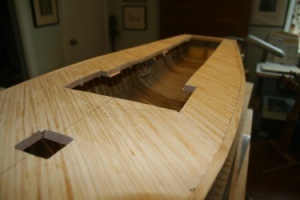 The area of the main cabin was left un-planked and the cabin framing set up as shown as a guide the planking, which was stopped at the forward edge of the cabin. 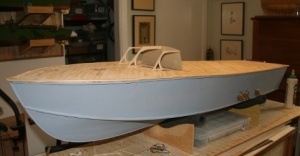 Once the first layer of planking was in place, the main access hatch was laid out, running aft from the cabin. This was not a hatch as on the original, but designed to give easy and full access to the hull interior during the rest of the construction and after completion. 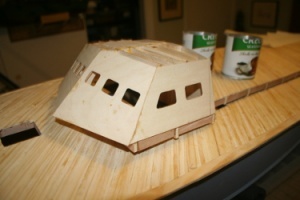 Once this hatch was cut, trimmed and fitted, the cabin was sheathed in plywood, turrets made up from Creole/Cajun seasoning cans (of paper) and the second, longitudinal layer of planking could be laid.